After our visit to Kiyomizu-dera, we caught a cab for Ginkaku-ji (aka Jisho-ji), the Silver Temple. 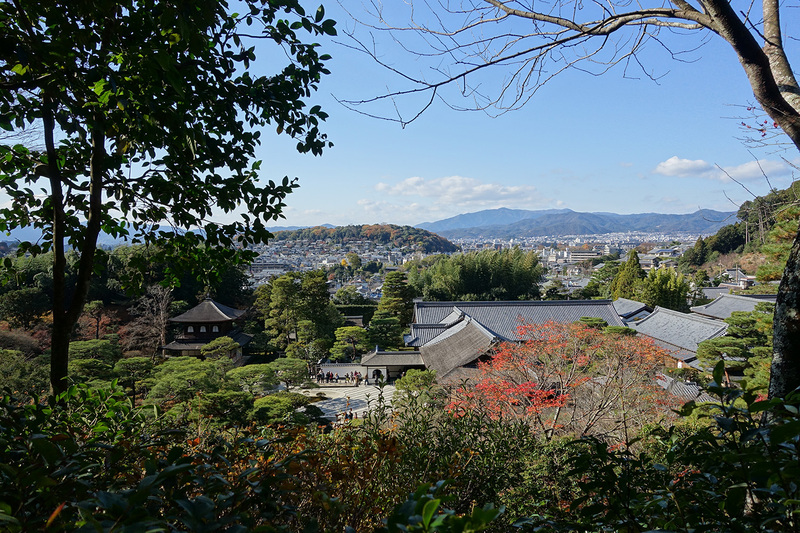 We heard that this temple had some of the best gardens in Kyoto and that was no exaggeration! Our cabbie dropped us off in front of a street blocked off to traffic and from there we made our way on foot to the temple. It wasn’t along walk and it felt a bit less touristy and commercial than the run-up to Kiyomizu-dera, though that could be because all of the tour groups were at that temple and hadn’t made there way to the Silver Temple yet. 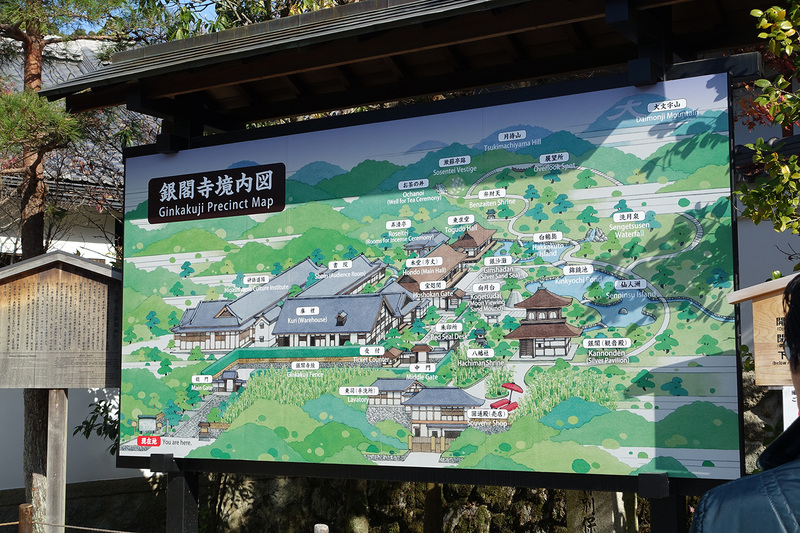 When we reached the temple entrance, we found a helpful map. Well, it was somewhat helpful considering we cannot read the Japanese characters but we could at least see a view of what the temple complex looked like. After purchasing our tickets, we passed by an outbuilding with immaculately manicured sand and trees. This was just a taste of things to come. Once we passed this entrance, we came upon what looked like a large pile of sand. 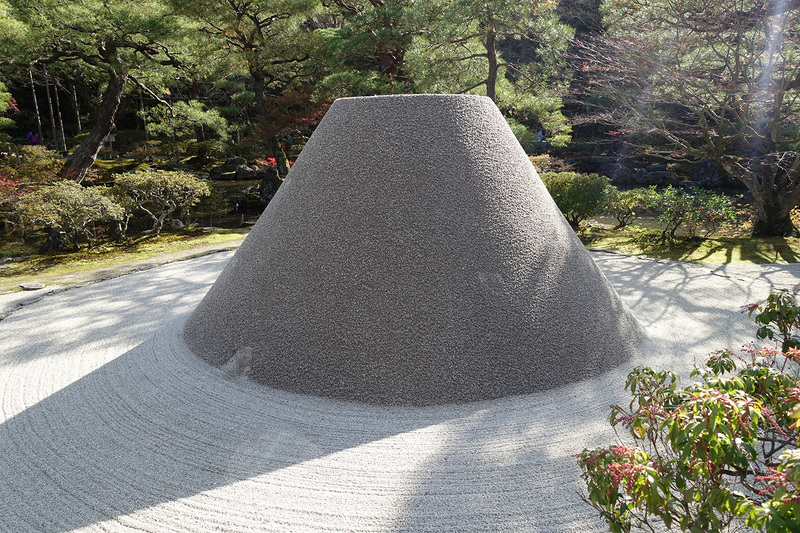 Ginkakuji is famous for its sand gardens and this huge mound is pure sand. I understand this is supposed to represent Mt. Fuji. It’s amazing to see something like this so perfectly formed with just sand! Turing to the right of the above photograph, we immediately saw the Silver Temple itself. Unlike the Gold Temple we saw yesterday, the silver temple was beautiful in its simplicity. So, why is it called the Silver Temple if it isn’t silver? 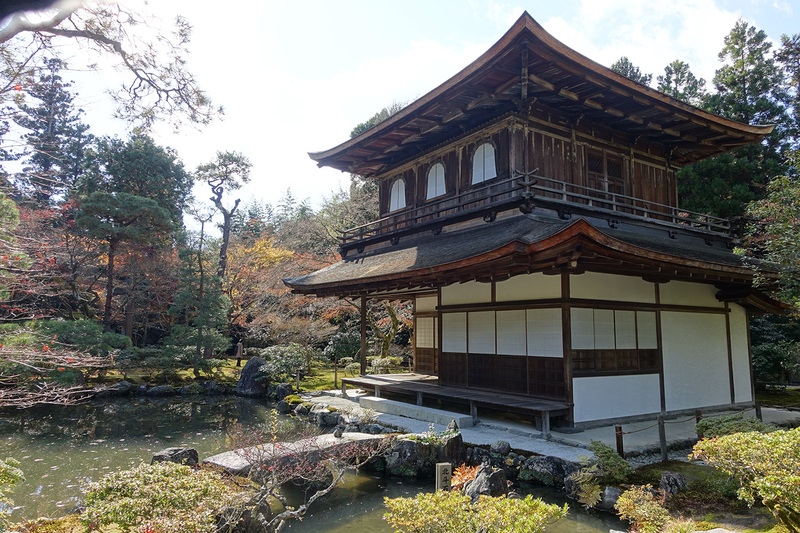 Well, the original intent of the Shogun who built it was to have it covered in silver and then to be used as a retreat. However, funds ran out and he died before it could be completed and it was then converted into a temple and remains without its silver adornments. 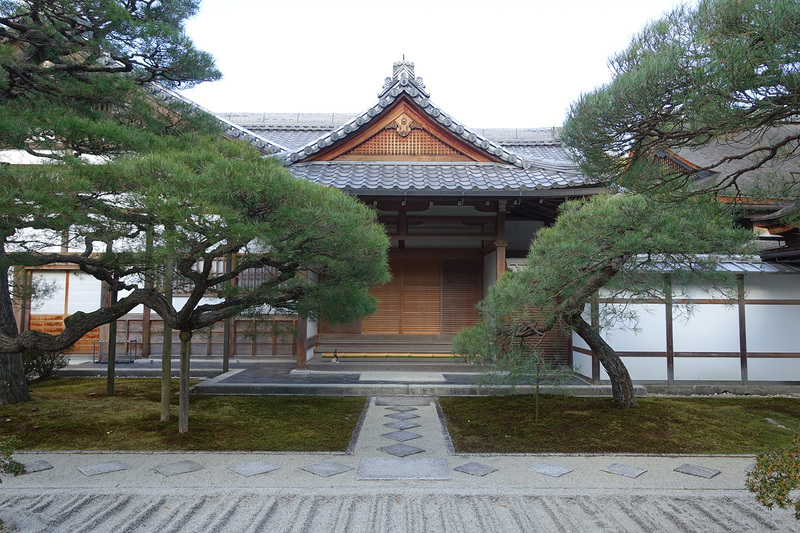 I think this is for the best – the simplicity goes well with the lovely grounds. That isn’t to say there are no adornments whatever. 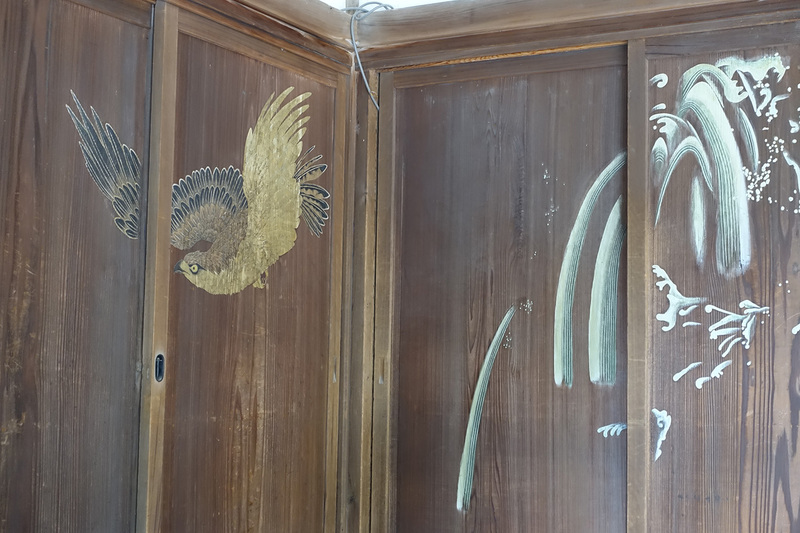 On one of the nearby outbuildings I saw some beautiful artwork painted on the sliding doors. 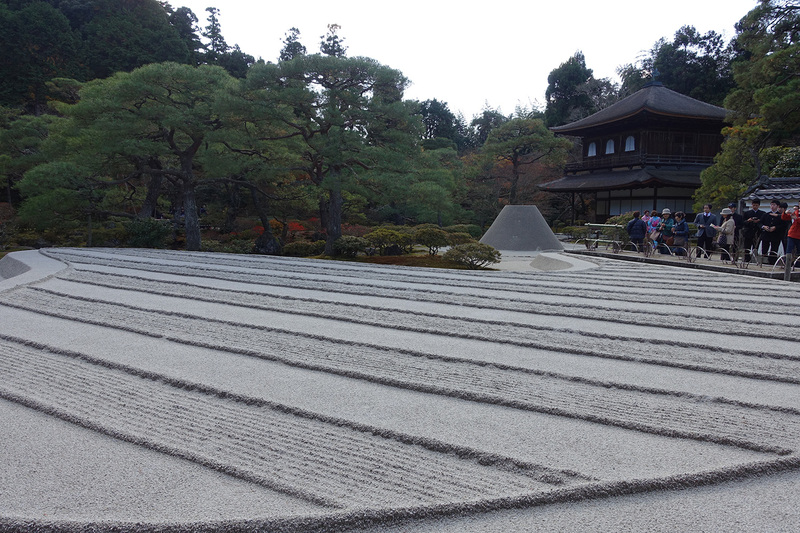 The sand gardens were impressive and precisely kept. It was really impressive to see! 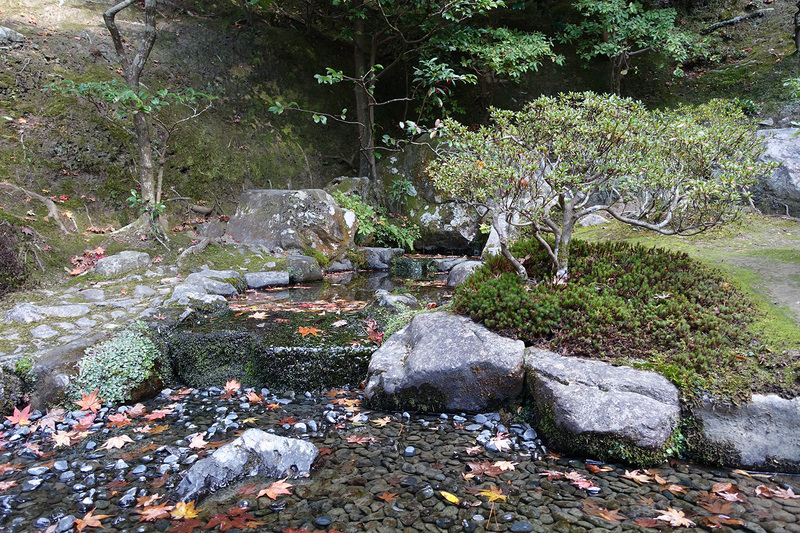 There were ponds and waterfalls as well as trees, bushes, and flowers that were clearly placed and kept with care and yet the feel of the temple was very natural and comfortable. 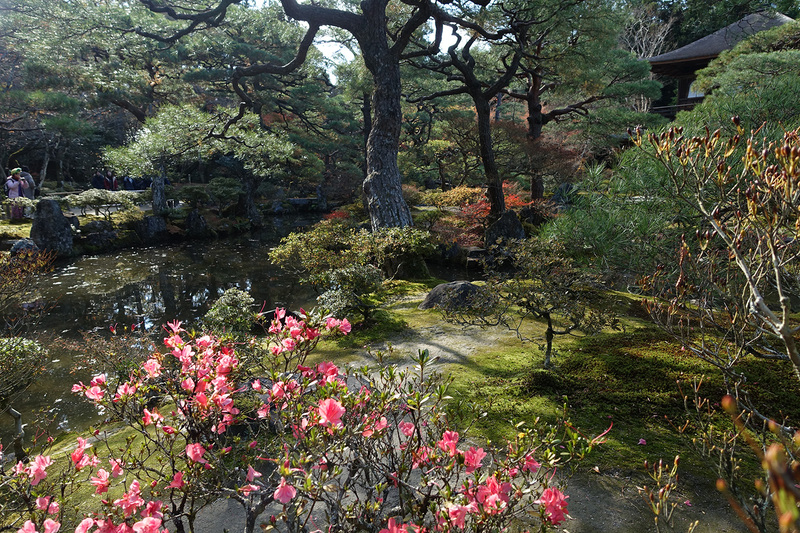 Here is a panorama of one part of the gardens. Despite the cold, there were even some flowers still blooming. 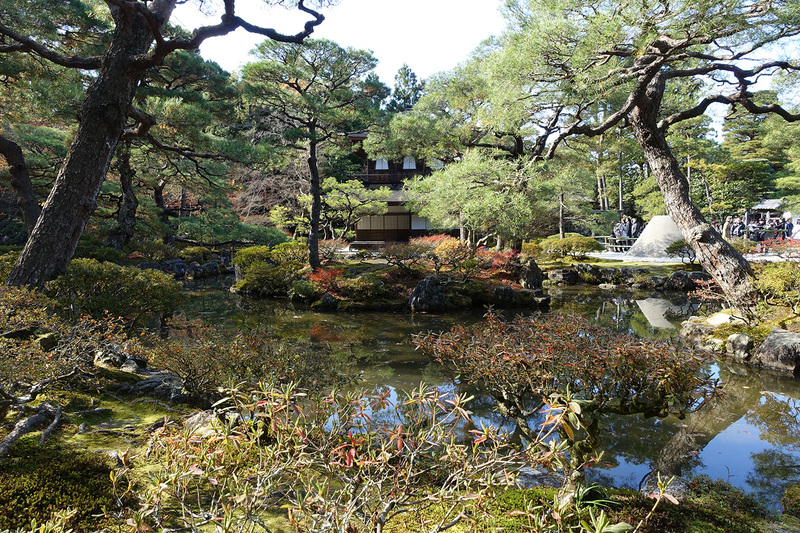 Here is a picture of the garden with the Silver Temple in the background. 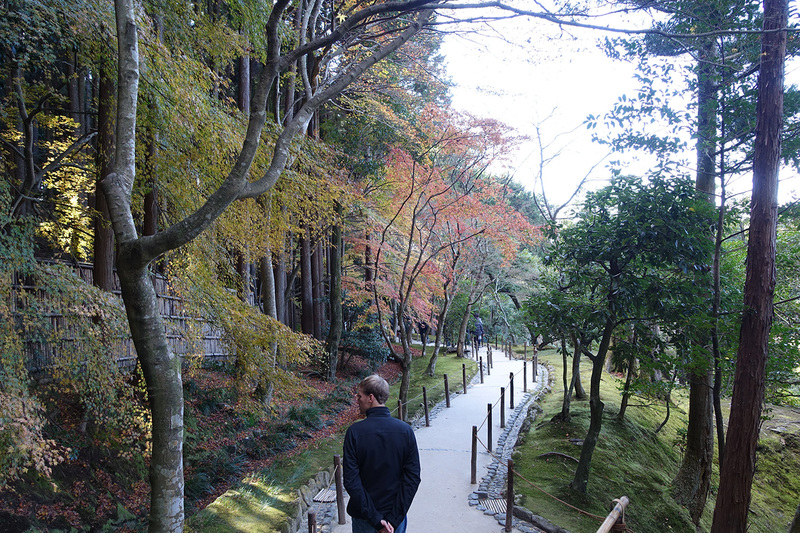 Well-groomed paths allowed us to meander through the garden and up into the surrounding mountains. There was even a bubbling stream gently carrying away some of the fallen maple leaves. 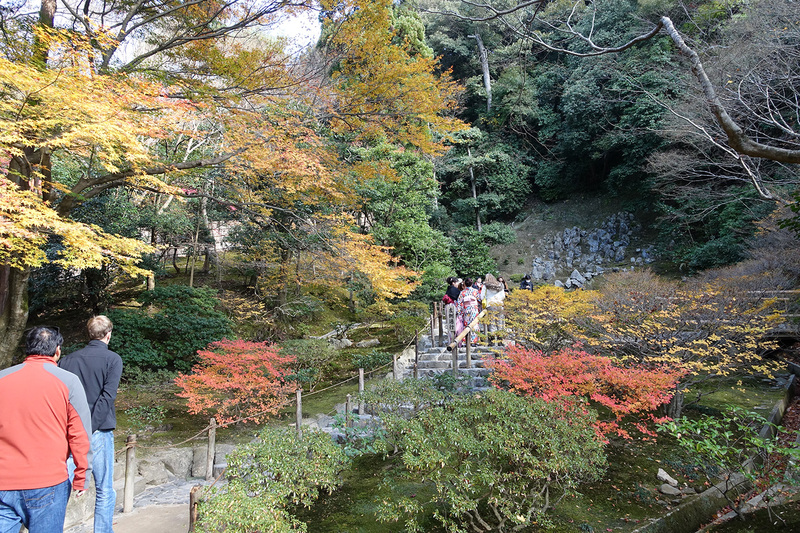 We continued to meander down the path to the exit and enjoyed more fall colors and the beautifully designed gardens. 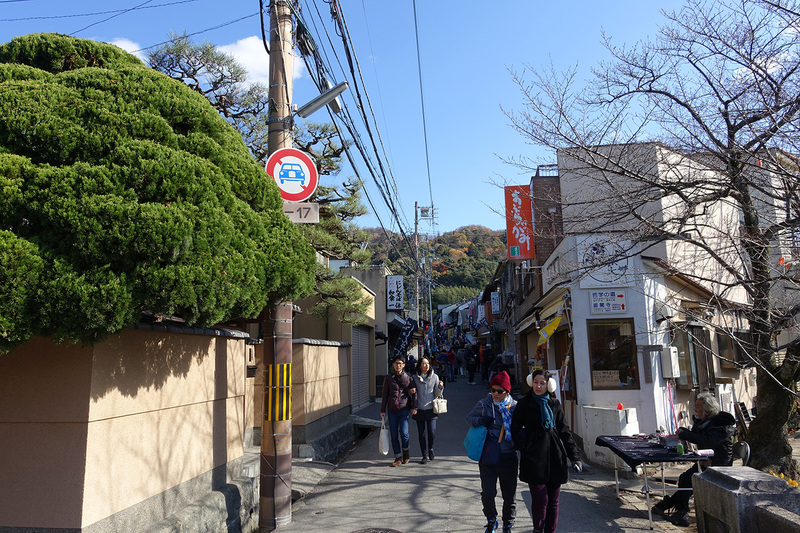 When we reached the bottom of the hill and the exit, it was clear that all of the tour groups had arrived – we even saw some faces we recognized from tour groups at Kiyomizu-dera early in the day. We were fortunate to have visited Gikaku-ji before so many people arrived so that we could savor the tranquility of the place. 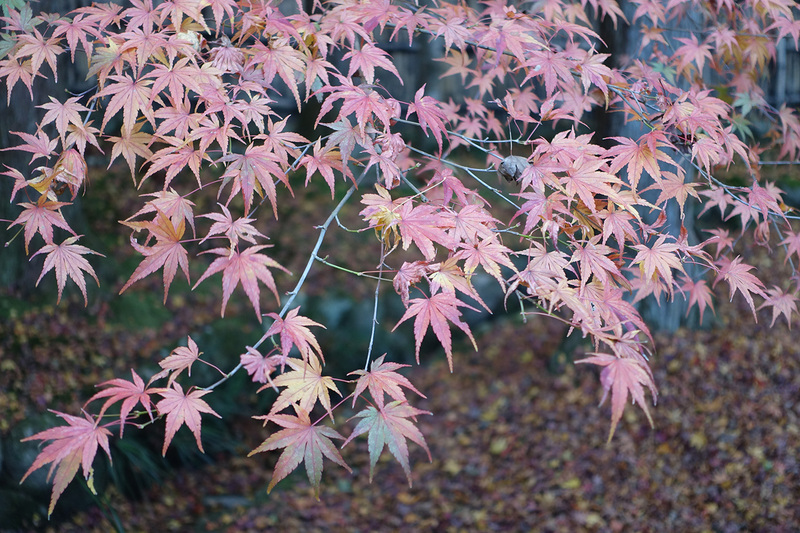 I’ll leave you with a shot of the some of the fall leaves we saw. Our next stop will be the Sanjūsangen-dō and the Gion District. Please stay tuned for the Part 3 post.